DearMYRTLE's Genealogy Blog: 1940 Census: Are you one in a million? 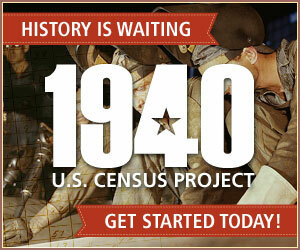 Did you march up to YOUR computer and SIGN UP as a volunteer to index the 1940 US census? If you did, then you are indeed 1 in a million, and I thank you in advance for making the 1940 census image index come to life. If you haven't yet, don't delay to become part of the 1940 Census: Million Genealogists March. Thank-fully the index isn't getting "shipped overseas", but will be compiled by those who register at www.the1940census.com. We will be using the FamilySearchIndexing.com interface. Now is a good time to practice using the desktop and mobile apps. The 1940 census project is quite unusual in that three genealogy entities have partnered to work together -- namely FamilySearch.org, BrightSolid (owner of FindMyPast and ScotlandsPeople.gov.uk, etc.) and Archives.com. I've heard at the RootsTech 2012 Bloggers Dinner that Ancestry.com was invited to participate, but they are doing their own thing. I think working together to make records available means no duplication of work, and no duplication of costs. That provides opportunities for the cooperating entities to spend the money they save on producing the 1940 on other digital imaging/indexing projects. NOTE: Prior to this, I've always been reticent to consider Archives.com as anything more than a genealogy search portal, since so much of what they offer in search results is found free elsewhere on the web. It remains to be seen if Archives.com is up to the task, and can handle the tremendous load on the servers when genealogists descend on the site. Since the images won't be indexed for some time (depending on how many indexers volunteer), we'll each be spending more time looking for each ancestor's census entry.